“They severely beat up the doctor, dragged him out of the hospital and even tried to kill him,” Deb said. Agartala: A doctor of a government hospital here was beaten up by family members of a patient after she died in the hospital’s labour room in the early hours of Friday, police said. The 25-year-old pregnant woman was admitted to the state-run Indira Gandhi Memorial Hospital around 1.20 am and she died of cardiac arrest around 2 am on Friday. Alleging medical negligence, the patient’s family then attacked and seriously injured the doctor, police said. The gynaecologist was admitted to the trauma care centre of the G B Hospital where his condition was stated to be improving. Addressing a press conference at his residence, Deb, who is also the home minister of the state, said, Dr Dipankar Debnath was attacked by a group of people after one patient died in a hospital’s labour room on late Thursday night. Security has been enhanced in two government hospitals following the attack on the doctor, the chief minister said. “This attack was inhuman and barbaric, and we cannot keep mum if anybody tries to take the law in his hand. The police has been asked to take stern action,” he said. Five persons were arrested in this connection. They were granted interim bail by a court but they are still in jail because they could not produce bail bonds. “The police will investigate the case seriously and take steps to punish them,” Deb said. The chief minister also appealed to the doctors not to close their chambers or outpatient departments (OPD) at the hospitals. In a joint statement, the All Tripura Government Doctors Association and the Indian Medical Association’s Tripura Chapter announced that doctors would close their chambers and refrain from voluntary services such as blood donation and health camps. They also and threatened to resign en masse unless their demands were met within a week. Their demands included the arrest of culprits in attacks on doctors in the past one year, setting up of police pickets and installation of CCTV cameras in government hospitals. “When the government assures to punish the guilty and enhance security for them, they should normalise the situation,” the chief minister said. 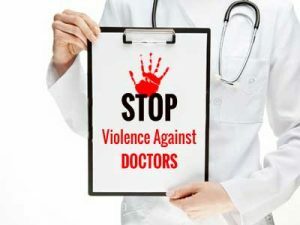 Deb said, another doctor posted at Sabroom Government Hospital was attacked by relatives of a patient on April 1 and all the accused were arrested. Meanwhile, Tripura Health Minister Sudip Roy Burman said he would surrender his police escorts in protest against the incidents of violence against doctors. It is “improper and unethical” for him to move around with escorts while doctors are being attacked, he said. “I am compelled to surrender police escorts as long as security in the Indira Gandhi Memorial Hospital and other district hospitals is not provided,” Burman said in a letter to the chief minister. “The government doctors and other staff have been feeling insecure working at various government hospitals,” he wrote in the letter. These attacks are sending negative signals to the fresh graduates and in the coming days they might leave the state, the letter said. stop working in tripura ! Appreciate Behavior & counseling are required by all groups of medical care givers besides treating doctors only. Every one in the team should take onus against violence by the public. The police security should be removed IMMEDIATELY to all the MLAs and Ministeres whenever such incidents happen in the state, by the GOVERNOR so that they will feel what is insecurity in doing work in the goverbment service. The Health minister\’s decision is examplary. All doctors (government or private) should be provided with LICENSED pistol/revolvar for self defence. They should carry it always whenever they are on duty OR off duty. Then only, the relatives will be afraid to do any thing because they see a weapon with the doctor.